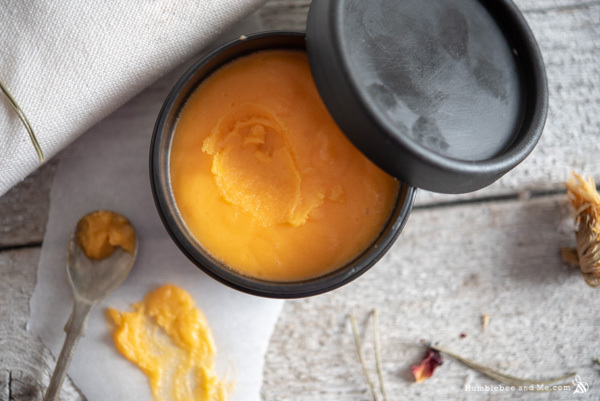 This beautiful Mango Mango Massage Butter is a combination of a few things that are on my mind these days. Thing #1: I’d really like it to be warm outside, and the smell of mangoes helps transport me to beaches and last year’s trip to Australia. Thing #2: I really like massages and was out of my coconut massage butter. Thing #3: I am so in love with this natural mango fragrance oil that I want everything to smell like mangoes all the time. Anyhow, I hope you love this hit of skin-loving mango goodness as much as I do! A lot of characteristics we want in a massage product are things I work to avoid most of the time—the main one being “play” time. That is, how long the product sits on the skin before absorbing—how long you can massage the skin before the product sinks in and more is needed. Extended play time is typically associated with products that feel greasy or oily, and I find most people prefer to avoid this sensation in products like lotions and body butters. Massage butter is a different beast, though! That play time is a big part of what makes a massage product good—we want lots of time to work with it so we aren’t constantly re-applying throughout the massage. As we work with the massage butter on the skin is needs to feel good throughout the massage; I find products thickened with wax eventually start to skid and warm up, so this massage butter is thickened primarily with silky smooth cetyl alcohol. When the massage is finished we want the skin to feel great; massage products are typically applied over a large surface area, and it would be really unfortunate to finish up a massage and have the wonderful relaxing sensation ruined by an overwhelming need to shower! 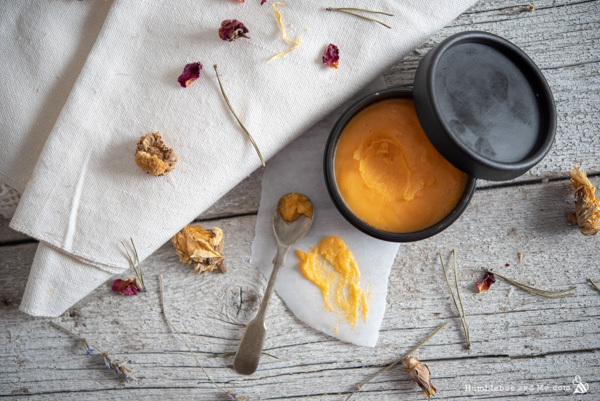 This Mango Mango Massage Butter leaves your skin feeling downright stunning thanks to a combination of some silky, emollient oils and some BTMS-50. 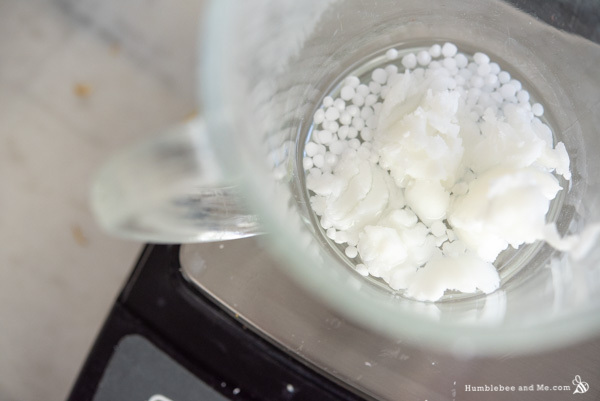 The cationic-ness of BTMS-50 is a bit of surprise magic; I have a few body butter recipes that include it as well and there’s always somebody in the comments who has fallen head-over-heels with the amazeballs skin feel that is BTMS + anhydrous balms. It is utterly swoon worthy, I promise! I’ve included a new-to-me ingredient as well—a natural dimethicone alternative called LuxGlide N350. It’s pretty neat! I don’t find it has quite the same longevity of movement as dimethicone 350 does, but it is a fun new ingredient to play with and a neat thing to have on hand for anyone who prefers more natural ingredients. I have both LuxGlide N350 (a natural dimethicone alternative) and LuxGlide N5 (a natural cyclomethicone alternative), both from Windy Point. For a project like this we want the richer, longer-lived slip of dimethicone, so I’ll have to wait for another project to pull out the LuxGlide N5! I’ve seen two suppliers recommend usage rates of 0.5–3%, but I can’t find that range in any of the product documentation from Inolex (the manufacturer of the INCI-identical “LexFeel” products)—they list no upper usage range, but do discuss neat usage, so I think it is safe to say we can surpass 3%. As with our body butter the scent comes from some oh-so-amazing mango natural fragrance oil from Essential Wholesale. It smells so juicy and fresh and tangy that my mouth waters a bit every time I smell it. 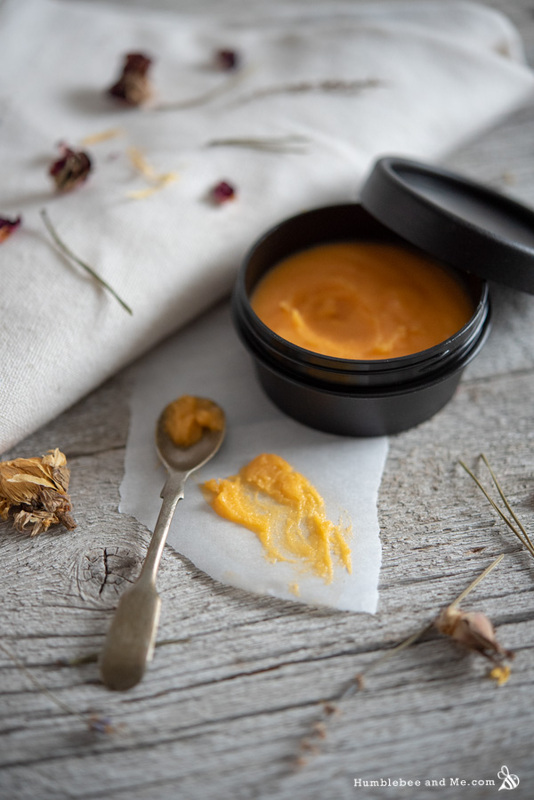 I’ve complimented the stunning mango scent with a bit of sea buckthorn fruit oil so the balm is suitably orange—it won’t dye your skin, though, don’t worry! The making is simple; melt, mix, and bring to trace in an ice bath before leaving it to set up. Once that’s done you’re ready for some massages that will make you long for the tropics! Prepare a water bath by bringing about 3cm/1″ of water to a bare simmer over low to medium-low heat in a small saucepan. 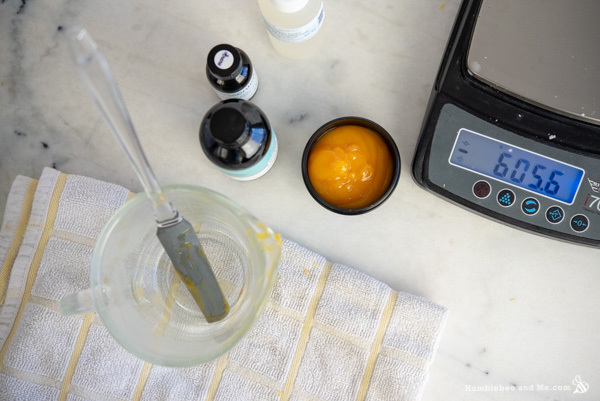 Weigh the heated phase into a small heat-resistant glass measuring cup. Place the measuring cup in your prepared water bath to melt everything through. Depending on where you live, you may need to microwave it to get the BTMS-50 to fully melt; mine never wants to melt in a water bath, so I used a few 15 second bursts in the microwave. While the mixture melts, prepare an ice bath by combining some cold water and ice cubes in a bowl large enough to accommodate whatever you’re melting the heated phase in. Once everything has melted, remove the mixture from the heat. Cool it in the ice bath, stirring constantly. Once it has turned milky white, remove it from the ice bath and stir in the cool down phase ingredients. 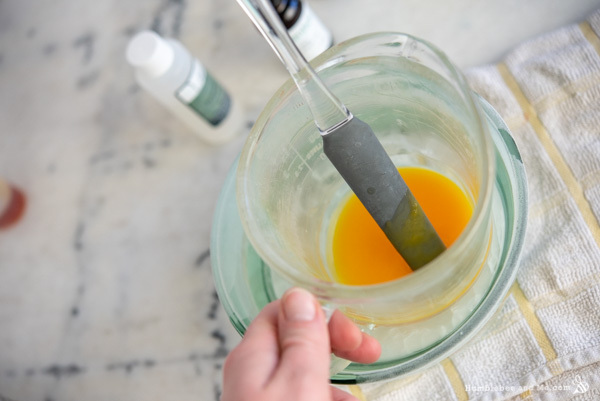 Pour the mixture into a wide-mouthed jar (I used one of these 50mL plastic jars from YellowBee) and leave it to set up for about an hour before using. To use, scoop up a small amount of massage butter and warm it between your hands before applying to bare skin and massaging away. Enjoy! 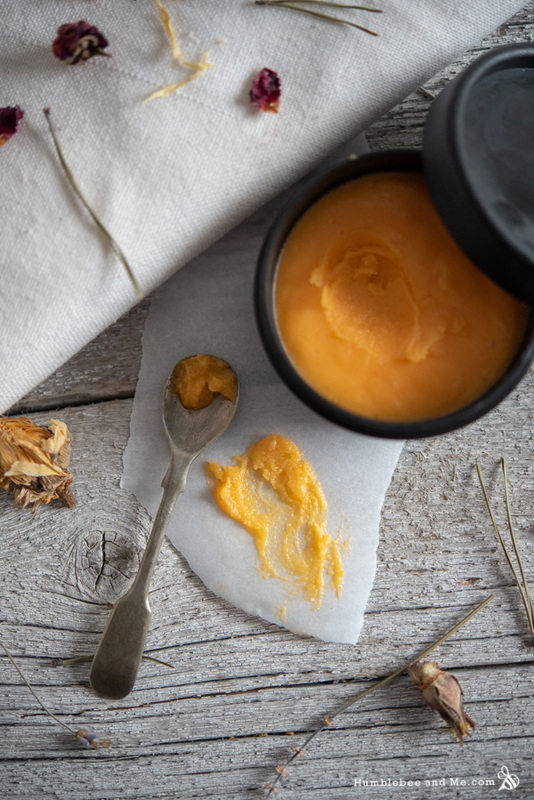 Because this massage butter is 100% oil based, it does not require a broad-spectrum preservative (broad spectrum preservatives ward off microbial growth, and microbes require water to live—no water, no microbes!). Kept reasonably cool and dry, it should last at least a year before any of the oils go rancid. If you notice it starts to smell like old nuts or crayons, that’s a sign that the oils have begun to oxidize; chuck it out and make a fresh batch if that happens. As always, be aware that making substitutions will change the final product. While these swaps won’t break the recipe, you will get a different final product than I did. As I’ve provided this recipe in percentages as well as grams you can easily calculate it to any size using a simple spreadsheet as I’ve explained in this post. As written in grams this recipe will make 40g. To learn more about the ingredients used in this recipe, including why they’re included and what you can substitute them with, please visit the Humblebee & Me Encyclopedia. It doesn’t have everything in it yet, but there’s lots of good information there! BTMS-25 will work in place of BTMS-50, though the end result will be less conditioning. Please don’t substitute the cetyl alcohol with anything else. You can choose different lightweight, inexpensive, glidey liquid oils in place of the fractionated coconut oil. You can use coconut oil in place of the babassu oil. You can use refined or unrefined, just keep in mind that coconut oil with a scent will definitely impact the scent of the final product. You can replace theLuxGlide N350 with dimethicone 350 (USA / Canada), or with more liquid oil or coconut oil. You can use a different fragrance if you prefer. 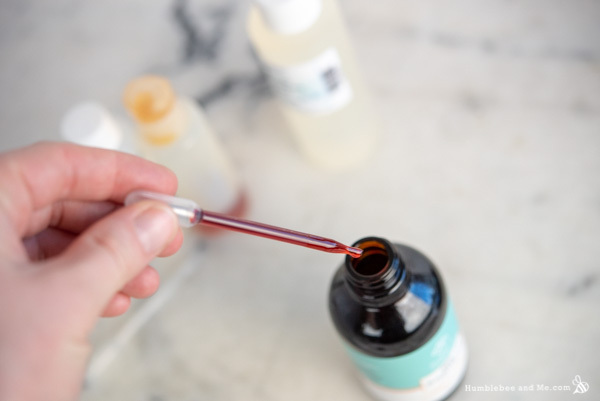 You can use a different orange oil (like buriti or sea buckthorn seed oil) instead of the sea buckthorn fruit oil, or you can replace it with more fractionated coconut oil (this will eliminate the orange colour). 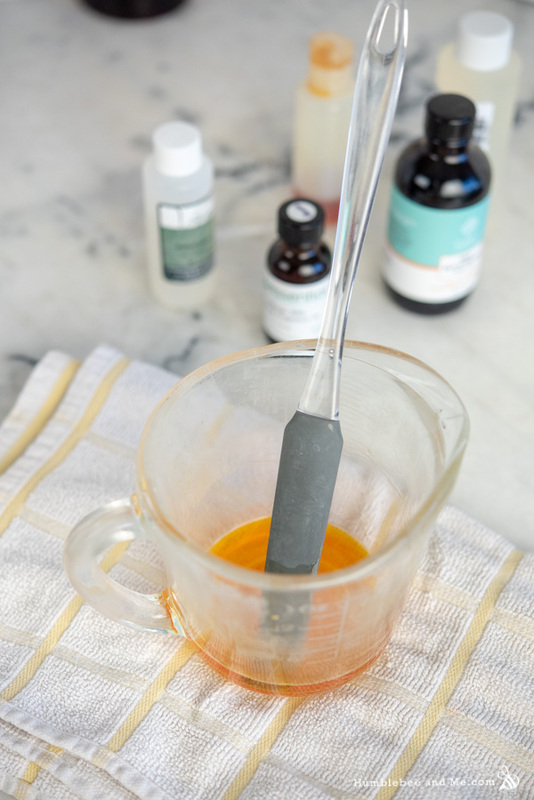 If you replace the sea buckthorn fruit oil with a non-orange oil you can try using 0.75% non-orange oil and 0.25% orange mica to keep the colour. 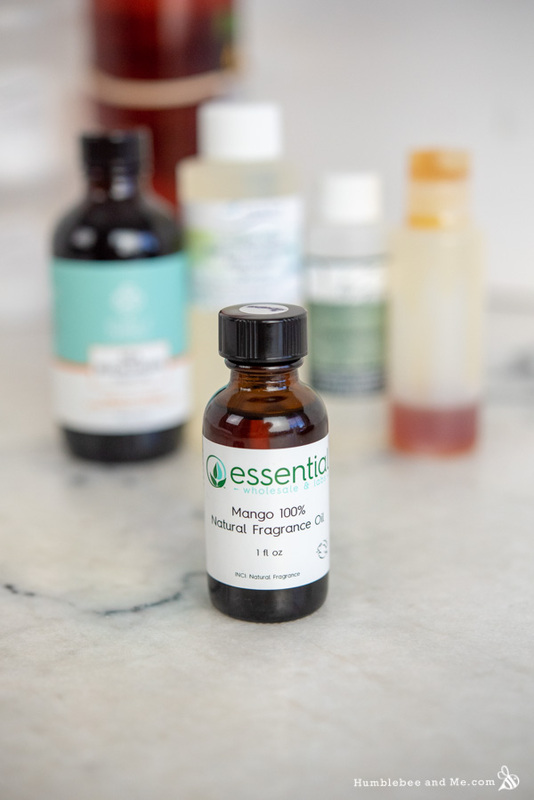 The natural mango fragrance oil was gifted by Essential Wholesale. 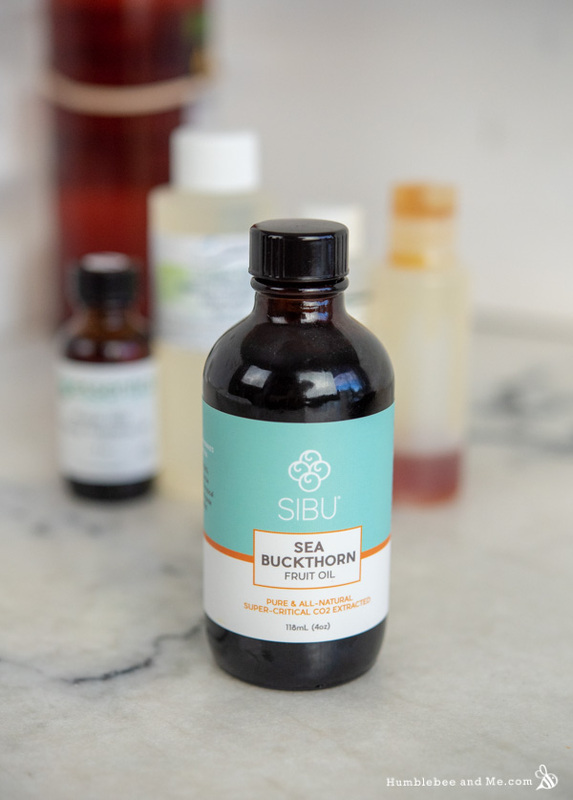 The sea buckthorn fruit oil was gifted by SIBU. Good thing your Sea buckthorn fruit oil was a gift. The 4 ounce bottle on SIBU is $50! Yikes. 🙂 Good to know. I’ll have to add it to my ever growing wish list. I’ve too many other ingredients I’d like to use up (if possible haha) for now. PS-now if only this site had scratch and sniff technology,…I imagine the mango fragrance smells amazing! Happy day to you! Can I use a melt and pour soap base instead of making my own soap base?